The mission is simple: save the galaxy. The well regarded sci-fi strategy game, FTL: Faster Than Light, has been around the PC and Linux crowd for a while. The developer, Subset Games, LLC, recently released FTL for the iPad where it continues to get rave reviews. To accomplish the game’s goal, you basically have to micro-manage everything on your ship in order to withstand the challenges that lie ahead. The narrative takes you through various sectors of the galaxy as you are tasked with delivering important information to the commanders of your fleet. You encounter challenges though, and you have to take control and make the tough decisions. What do you do when the shields are down? Do you have enough power to escape? The adventure is random every time, and when you die, you’re dead. The gang at Subset obviously put a lot of thought and programming into the game for the iPad, and the game has enjoyed success. 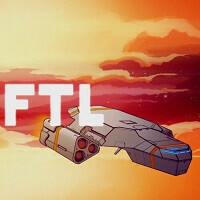 FTL got its start thanks to crowd funding through Kickstarter. Justin Ma, one of the developers, says the game is doing better than expected, but “iOS devices aren’t really a platform we like developing on or designing for,” noting that PCs are what make their hearts tick. Touchscreens appear to be biggest part of the challenge, “I doubt we’ll start a project with touchscreens in mind.” Ma then goes on to say however that Subset Games is looking into bringing FTL to Android tablets and tablet PCs. The technical challenges with touch are magnified when just about everything in FTL is interactive. Ensuring that being able to select the smallest element on the smallest device (in this case the iPad mini) was critical while keeping everything visible on the screen. The pains of success. This is what might happen if you make something so good that people clamor for you to make it everywhere -- it is hard to ignore. Yup. Nothing beats mouse + keyboard for gaming. Also that means, they actually meant touch screens in general and not just iOS devices. I disagree. Nothing beats picking up a nice Xbox or PS (especially DS4) console controller, even if you're using it for the computer or mobile phone. Depends on the game. Hack n slash games are best played on a console controller. Most platform game, sandbox games (GTA) or action games like prince of Persia play better with a controller. But RTS and FPS most definitely play better with mouse/keyboard. No comparison what so ever. Of course haha :) I want to get a steering wheel as well I might get one once GRID 3 comes out! Gonna have to agree that it depends on the game as far as whats better to game with. Although....personally I cant game with a mouse and keyboard. Its controller and controller only for me. Unless its The Sims. FTL is amazing, but you will probably have a better experience on PC, and it is pretty light on specs, plus PC means a wealth of free mods that adds a lot to an already feature-packed game. But if you arent much of a PC gamer and have an Ipad, download that right away!